The world is generating more data than in other time in history. However, with the increasing quantity and quality of data flooding our cyberspace comes new challenges. One clear challenge is how to make meaning of all this new data, a feat that will continue to be difficult without some level of data interoperability being implemented. This is the emerging new frontier for the data revolution. In the agriculture research sector, solving this challenge could have a catalytic impact on the quest for new and improved varieties of crops to help in efforts to end hunger. When datasets emerging from maize, wheat or rice research can be used by others, progress could be accelerated. There would be less duplication of efforts and the possibility to extract insights we wouldn’t have access to otherwise. Interoperability of research data is an area of work the Research Data Alliance’s Interest Group on Agriculture Data has been focusing for a while now. The IGAD has 3 working groups systematically working towards solving the challenge of data interoperability and common semantics and ontologies. 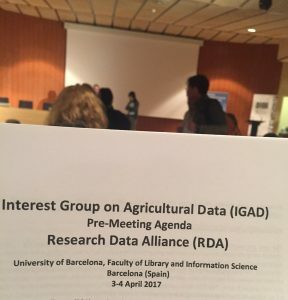 During the 9th Plenary of the Research Data Alliance held in Barcelona, Spain this past April, the IGAD convened a two-day meeting. During the event the working groups shared progress made, received feedback and charted the way forward. For those of us working in the general open data for agriculture space, the progress made by the working groups inspired confidence that we are on track to making better meaning of the research data being published in the open. A notable example of progress being made in agriculture research data interoperability can be found in the work of Wheat Data Interoperability Working Group’s Wheat Initiative Information System (WheatIS). This past September, the working group published wheat data interoperability guidelines to help move progress on this globally. The guidelines, available here, include potential use cases and ontologies to support adoption and use. A common vocabulary and ontologies are also key in ensuring we can make better meaning of the vast amounts of data becoming available every day. The UN Food and Agriculture Organisation has in the past hosted what is probably the largest single vocabulary collection for agriculture in the world. Agrovoc is the starting point for any individual or organisation working towards giving their work globally constituent meaning through the use of a known vocabulary. But for semantics to work well, we need more than just a vocabulary. That is why FAO, CABI and USDA collaborated to convene a working group to address semantics whose output between 2014 and 2016 was the Global Agriculture Concepts Scheme containing more than 10,000 concepts. With common data interoperability standards, a common vocabulary and common thesauri, the data revolution in agriculture and nutrition can begin to truly move from open data to easily extractable meaning. In my view, this is one of the improvements needed in the sector in order to begin closing the data-to-policy-to-practice chasms which result in a great deal of information but no actionable insights for those trying to get a job done. Data interoperability in agriculture should not be left to just one platform or consortium. RDA, FAO and working groups such as the IGAD understand this. That is why RDA is working together with GODAN and CODATA to address, not just the data interoperability and availability challenges, but also the capacity development and community engagement aspects as well. 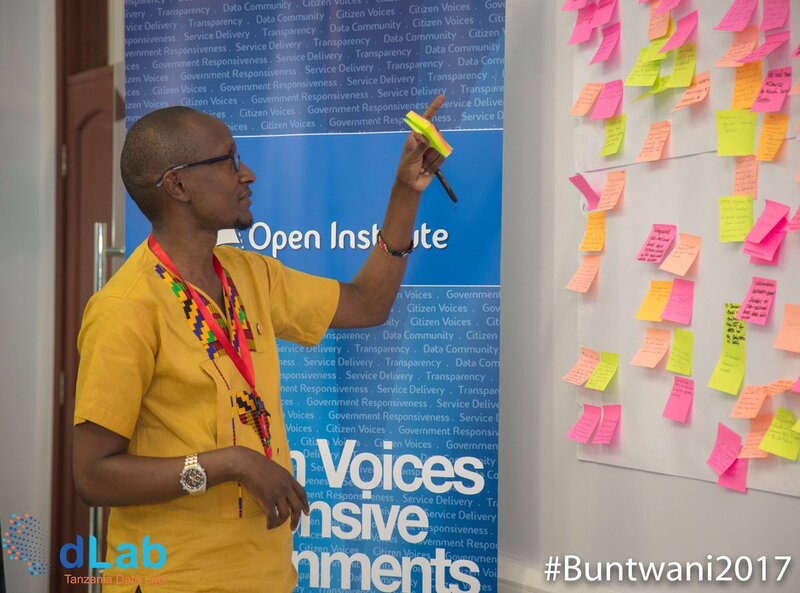 To end hunger, poverty and reduce inequality in the global south, we need to go beyond publishing datasets to implementing actionable insights informed by evidence. And for us all to get better at doing this, we need partnerships. At LDRI we are delighted to be part of one effort, the GODAN Capacity Development Working Group, that is focused on closing the data-to-practice gaps. We continue to explore ways through which we can collaborate with partners in CODATA and RDA to improve availability and use of open data for agriculture and nutrition. We are grateful to our colleagues at GODAN for making it possible for LDRI to participate in the 9th RDA Plenary and we look forward to supporting efforts of partners to improve data interoperability in agriculture and nutrition.